We all know the saying “If pigs could fly” but did you know they could swim? 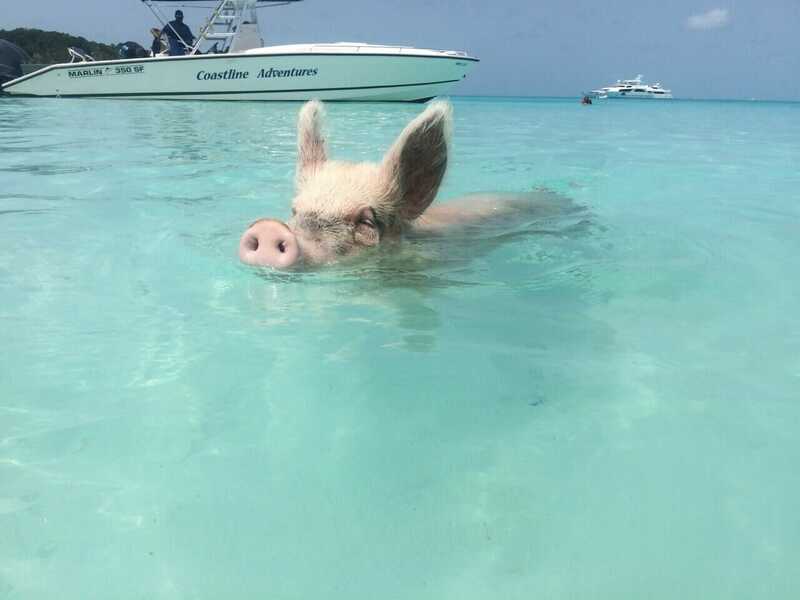 I remember when I saw the first pictures and videos of pigs swimming in the crystal-clear turquoise water of Exuma, an archipelago comprising more than 365 islands, in the Bahamas. 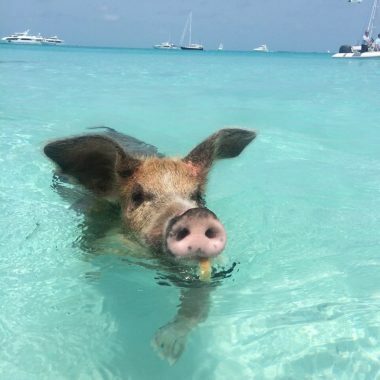 These world-famous and super cute swimming pigs of Exuma live at Big Major Cay, also known as Pig Beach, an island entirely uninhabited by humans, located around 132 Km (82mi) southeast of Nassau, Bahama’s capital, and 80 Km (50 mi) northwest of George Town, Exuma’s capital. 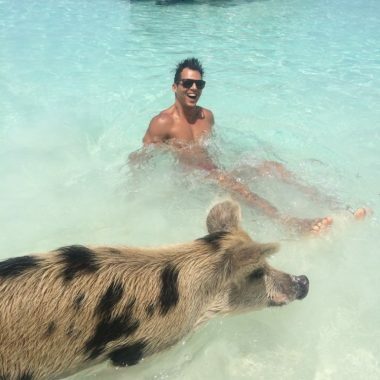 How the pigs got to Big Major Cay nobody knows, but the fact is that they live in a piece of paradise. The Pig Island is located between Nassau and George Town. I had the opportunity to visit the Bahamas and went swimming not only with pigs but also sharks in Exuma and had an unforgettable time! If you want to know how to get to Pig Island to have one of the most unique experiences in the Caribbean and also how to book a Pig Island tour, do not worry because I’m covering everything on this post. How much is to go to Pig Island? 1 – The closest airport to Pig Island is in Staniel Cay and the only airline that takes you directly to the swimming pigs within the Bahamas is Flamingo Air. The flight takes around 40min each way and costs approximately US$ 250 the round-trip. From Staniel Cay you can take a Pig Beach tour with Island Rentals at a cost of US$ 350 + 12% VAT / person up to 2-3 people or US$ 250 + 12 % VAT for 4 or more guests. They will pick you up and drop you off at the airport and take you to several islands in Exuma. Staniel Cay Vacations offers Pig Island tours from US$ 224 (VAT Included) and also combined tickets at a cost of US$ 500 / person (US$ 299 for the tour + US$ 200 for the airfare on Flamingo Air). If you want to save US$ 100 and pay only US$ 400, for the round-trip flight tickets + tour, you can book your excursion online here with Viator. 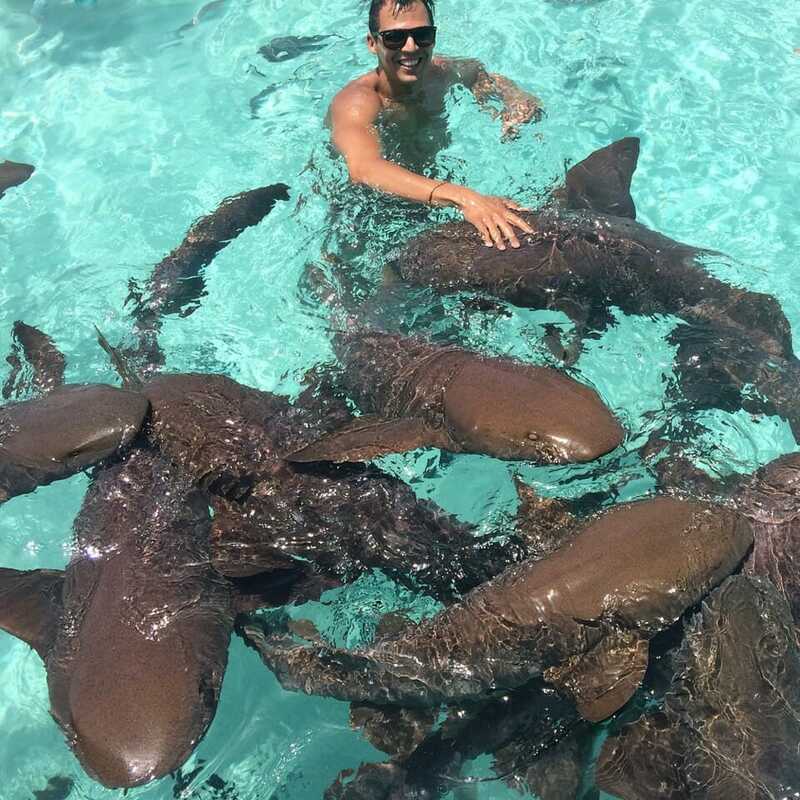 The tour has six stops and apart from swimming with the pigs, you’ll also get the chance to feed iguanas and pet sharks, with time left over to relax on the beach or head over to a local restaurant for lunch before your return flight to Nassau. P.S. 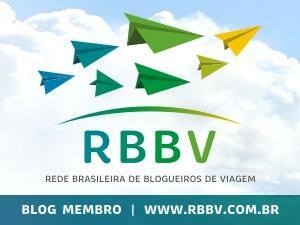 : The flight has only few seats, so it’s highly recommendable to book your ticket in advance. Check out the reviews and tour details here. 2 – You can fly daily from Nassau to George Town, Exuma’s capital, with Bahamas Air and the flight will cost you around US$ 200, depending on how long in advance you book your tickets. In George Town you can book a Pig Beach Tour with Coastline Adventure and they will pick you up and drop you of at the airport. The tour costs US$ 200 + VAT and takes 7h. 3 – You can book a day trip from Nassau to Pig Island by boat for approximately US$ 380. With Harbors Safari, the powerboat departs at 8:00 AM from Bay Street Marina and with the two other companies at 8:30 AM from Margaritaville Restaurant at the Paradise Island Ferry Terminal. The three tours take up to 8-9h and are subject to weather conditions. If you’re staying at Atlantis Hotel & Casino you can just walk to the Terminal in Paradise Island. Check out the full details and get current price of the “Famous Swimming Pigs Tour Bahamas” here. 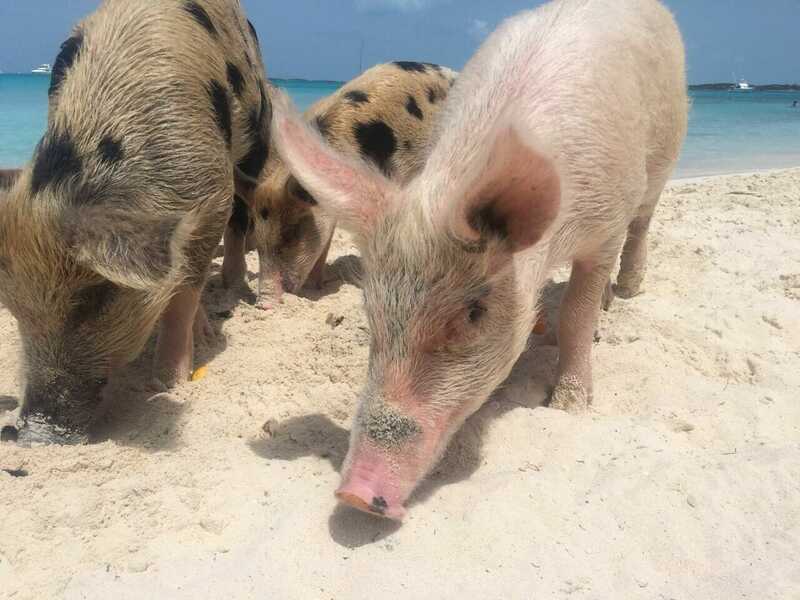 Pigs of different colors, sizes and ages at Big Major Cay, Bahamas. 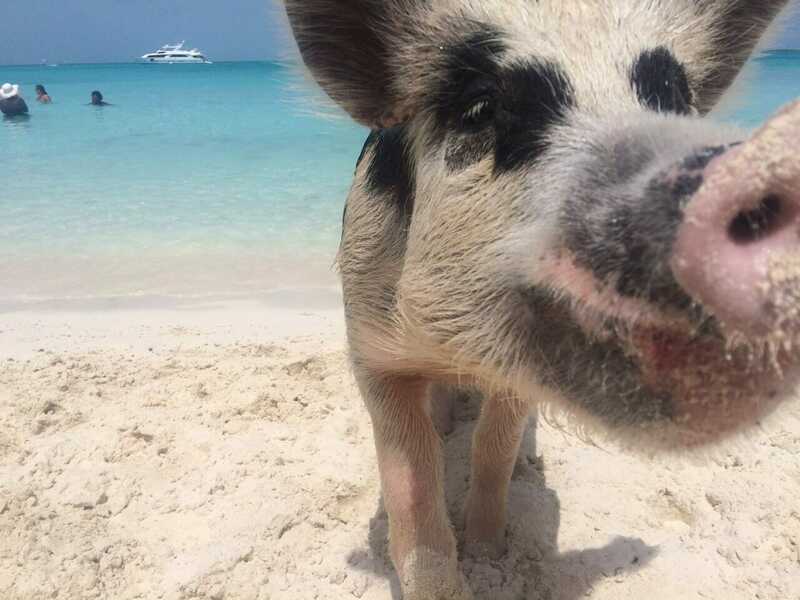 To get to Pig Beach from Miami you have the option to fly directly to George Town with American Airlines or fly to Nassau and then take another flight to Exuma or take a day trip to Pig Island. Note that with both options you won’t be able to take the tour on the same day that you arrive. Another option is to take the FRS Caribbean ferry from Miami to Bimini (another stunning Bahamian island) and from there you can fly to Nassau and then go to Pig Beach. For more options of how to get to Pig Beach from Miami area check Fort Lauderdale options below. The famous and super cute swimming pigs of Exuma. 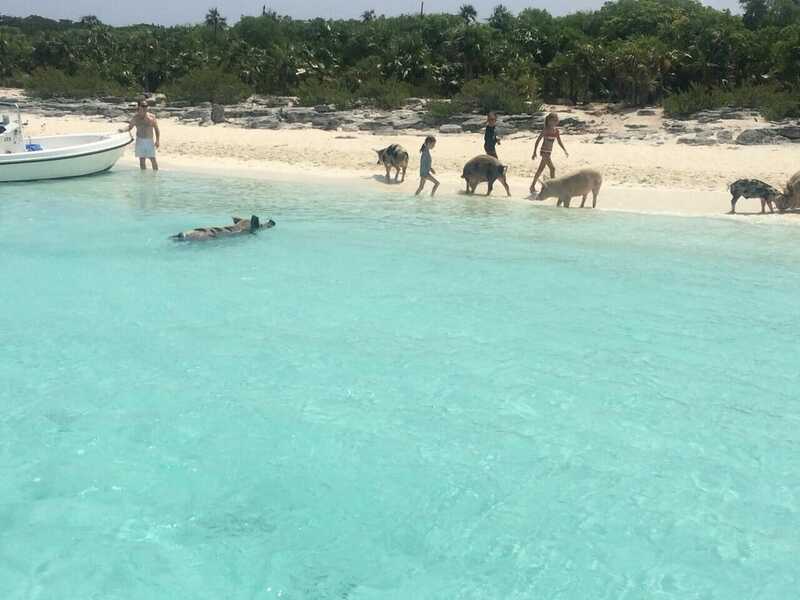 To get to Pig Beach from Fort Lauderdale the easiest option is to fly direct to Staniel Cay with Makes Air (Watermakers Air), average price: US$ 600 per round-trip. Bahamas Air Tour offers a day-trip to Staniel Cay on a private air-craft. The tour departs at 7:30 AM and the average cost is US$ 800 + tax for the round-trip tickets + tour. You can also take a non-stop flight to George Town with Silver Airways, which can be much cheaper. And there is also a ferry from Fort Lauderdale to Freeport, but from there you will need to take another ferry or a flight to Nassau first, then get to Pig Beach following one of the options above. 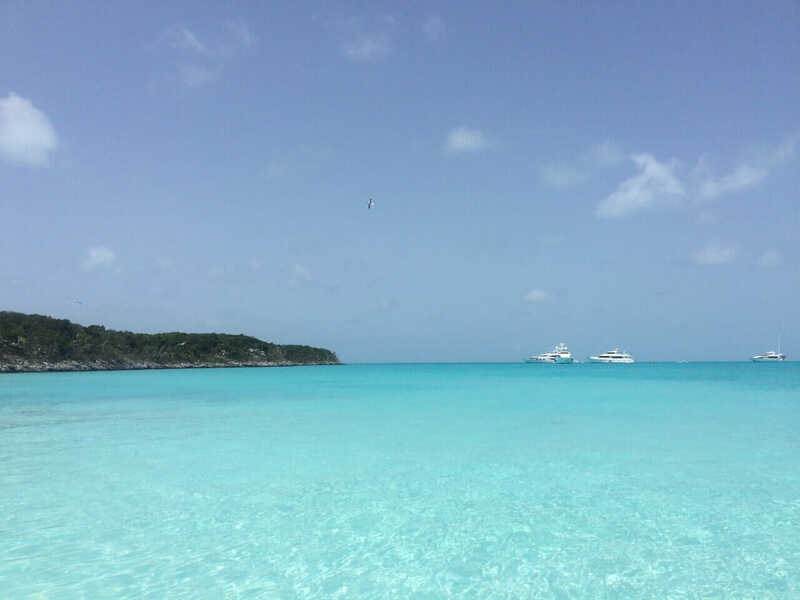 While planning my Three-day trip to the Bahamas, one of the places that I really wanted to see was Exuma, which features some of the clearest and most beautiful sapphire-blue water on the planet. The crystal-clear turquoise water of Exuma. When I discovered that I could go swimming with pigs and sharks in Exuma, I hesitated a bit at first, because I was scared of sharks, but then decided do it no matter how much money I would have to spend. 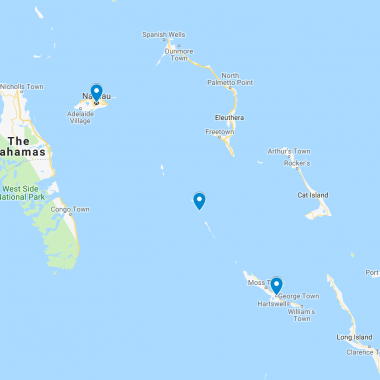 I contacted Coastline Adventures and they gave me all the information I needed in order to go to Exuma from Nassau for the day trip to see the hilarious swimming pigs. I took the first flight from Nassau to George Town at 6:00 AM, the driver picked me up at the airport around 7:00 and then the other people who were joining the tour at their hotels. The Coastline Adventure Swimming Pigs tour was excellent! We sailed on the crystal clear water of different shades of blue, saw some islands owned by celebrities, stopped on a breathtaking sand bank, went to Thunder Grotto (where two James Bond movies were shot), passed Nicolas Cage’s Island and off course went swimming with pigs at Big Major Cay and with sharks at Compass Cay. The music on the boat was really good, and the vibe was awesome. We had free drinks and a lot of fun feeding and swimming with the pigs. You will have a lot of fun! Playing with the pigs, Bahamas. In the end they dropped me off at the airport on time to catch my flight back to Nassau. 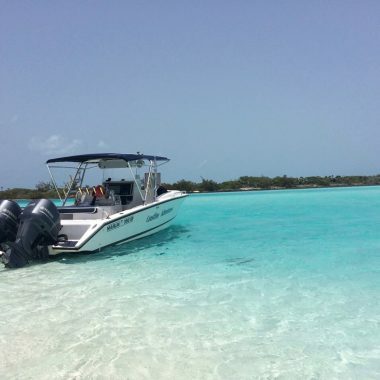 Now Coastline Adventure offers tours with two different time slots: one for daily trippers that departures at 10:30 and returns at 5:30; and the other for people who are staying on the island of Great Exuma, that starts at 8:30 and finishes at 4:30. The Swimming Pigs Tour covers a total of over 120 miles. So be prepared to spend a lot of time on the boat and under the sun. To go to Pig Island you will spend at least US$ 379. Whether you take a Swimming with Pigs Tour from Nassau, Paradise Island or fly to George Town (Great Exuma). I’m not adding here the costs to get in the Bahamas because it can vary significantly depend of many factors, such as time of the year, distance traveled, etc. If you’re flying directly to Staniel Cay from Nassau the minimum you will spend will be US$ 400, and from Fort Lauderdale (Miami area) around US$ 900. – The full day Swimming with Pigs tours are long (8-9h) and you spend a considerable time on the boat. – Bear in mind that open sea safari tours are not suitable for expectant mothers, infants and persons with back, knee, neck and heart problems or conditions affected by high-speed travel. – The tours that depart from Nassau and Paradise Island is subject to cancellation due to weather conditions (wind, rain, hurricane, etc), so make sure to book it for the next day after you arrive, so if it gets canceled, you may have another chance to do it. – Flying direct to Staniel Cay is much easier, faster and you will spend less time sailing, but it’ll be more expensive. 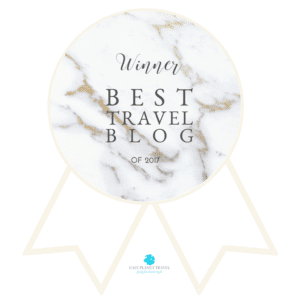 – For me the best option is to stay two or three nights in Grand Exuma, take the tour in one day and enjoy the islands / beach in front of the hotel during the others. – If you have limited time, my recommendation is to book this tour. – Note that if you’re traveling to the Bahamas on a cruise ship you might not have enough time to take in a Swimming with Pigs Tour. – Pack light and don’t forget to bring sunscreen, hat, sunglasses and your camera please. 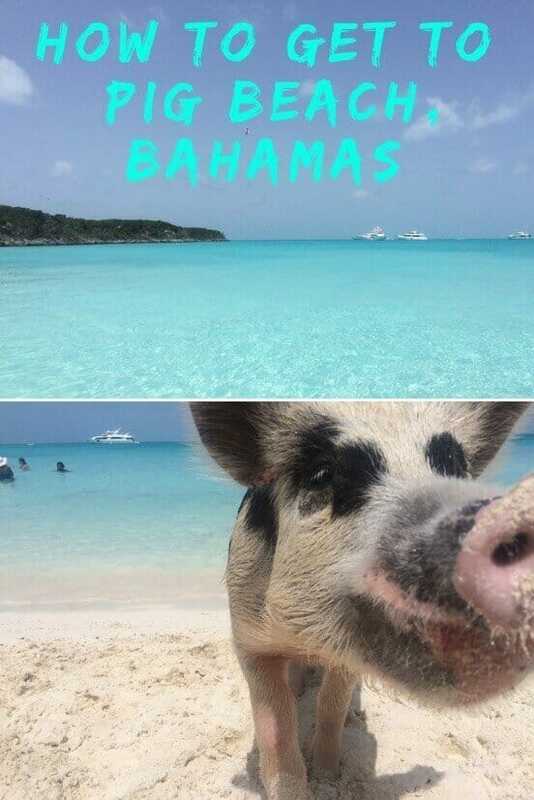 Safe travels and have fun in the Bahamas and swimming with the pigs in Exuma. Don’t forget to buy a travel insurance, which can literally be your lifeline if something happens to you and if your luggage is lost or stolen. I always use World Nomads Travel Insurance for independent travelers. It’s easy to buy, extend & claim online, even after you’ve left home. Get your travel insurance here. The Bahamas is located on the Atlantic Ocean, 80Km (50 miles) off the coast of Florida. The country is comprised of 700 island sprinkled over 100,000 square miles (check map here). ∗ The main airport is the Nassau International Airport, now known as Lynden Pindling International Airport, is situated 10 miles (16 km) west of Nassau, New Providence Island. You can book your flights with Skyscanner that is the website that I use and trust. ∗ From the U.S. there’re direct flights with: Delta, United, JetBlue, BahamasAir and Southwest Airlines. ∗ There’re direct flights with Air Canada departing from Canada. ∗ From other countries is easier flying to the U.S., Miami or Fort Lauderdale, then taking another flight from there. ∗ To Exuma, there’s an international airport in Moss town, northwest of George Town, and there’re direct flights from Nassau, Miami, Atlanta and Toronto. ∗ Theres is also a ferryboat from Nassau to Exuma with Bahamas Ferries, but it’s a very long journey. ∗ The Bahamas can be visited all year-round with temperature ranging from 21C (70F) in the winter and 26-32C (80-90F) during the summer. The hurricane season lasts from June to November. The months with most rain are May and June. Exuma: Grand Isle Resort, Paradise Bay, Hideaways Exuma, Sunrise at Three Sisters, Exuma Beach Resort. Nassau: Sandyport Beach Resort, Marley Resort & Spa, British Colonial Hilton Nassau, Holiday Inn Express, Meliá Nassau Beach. Paradise Island: Sunrise Beach Club and Villas, Bay View Suites, Comfort Suites, The Cove Atlantis, Warwick Paradise Island.